The 20th century is called the "Century of War." The massacres and the destruction that the two world wars brought about were perceived as something very close to the crisis of whole human species. Though it was hoped that this vast devastation would be followed by peace, it has never been so. Immediately after the second world war was over, the Cold War began between the two blocs, led by the United States and the Soviet Union. The Korean War broke out in 1950. The US started military intervention in Vietnam as early as in 1955, and eventually went into full-scale warfare in 1964. And it was not surprising that the Soviet Union invaded Afghanistan in 1979. Still today, having had almost two decades of the 21st century, we continue to have wars breaking out now and then somewhere in the world. 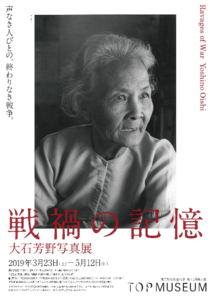 Oishi Yoshino has been facing voiceless people who are suffering from the tragic scars of war, and pursues the meaning of peace through the lens. Wounds of the Pacific War remain in Hiroshima, Nagasaki, Okinawa and the Korean Peninsula. The calamity of war is still remembered as "Grief of the Mekong" in Vietnam, Cambodia and Laos. Ethnic conflicts and religious confrontations which led to the Holocaust have become dominant again and tormenting people in Afghanistan, Kosovo, Sudan and other countries. This exhibition introduces about 150 works from the photographer's career of more than 40 years, visiting many victims of war and shooting the ravages of war for us never to forget them. □Sponsor: Canon Marketing Japan Inc.